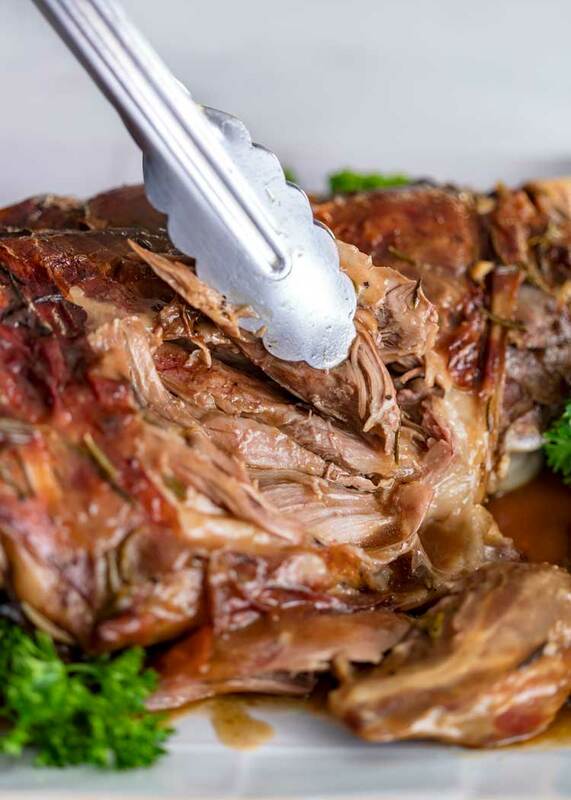 This Slow Roasted Leg of Lamb is hands down my favorite way to cook lamb. Seasoned and laid over cut vegetables, garlic, oranges and rosemary, this slow roasts, caramelizes to a rich, golden brown, and the pan juices make for an easy gravy. 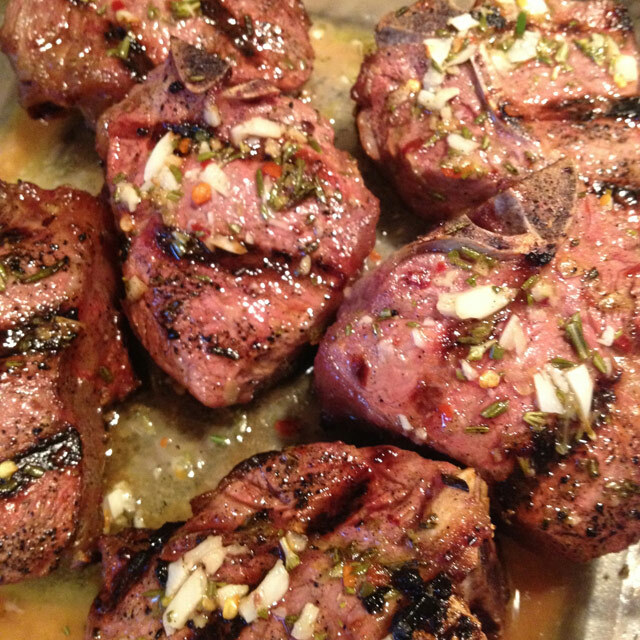 Typically I’m one to choose lamb loin chops and make Grilled Hoisin Lamb Loin Chops, Mongolian Grilled Lamb Loin Chops, Roasted Garlic Balsamic Glazed Lamb Loin Chops, Lamb Loin Chops in Honey, Madeira and Mint or these Lemon Rosemary Grilled Lamb Loin Chops. 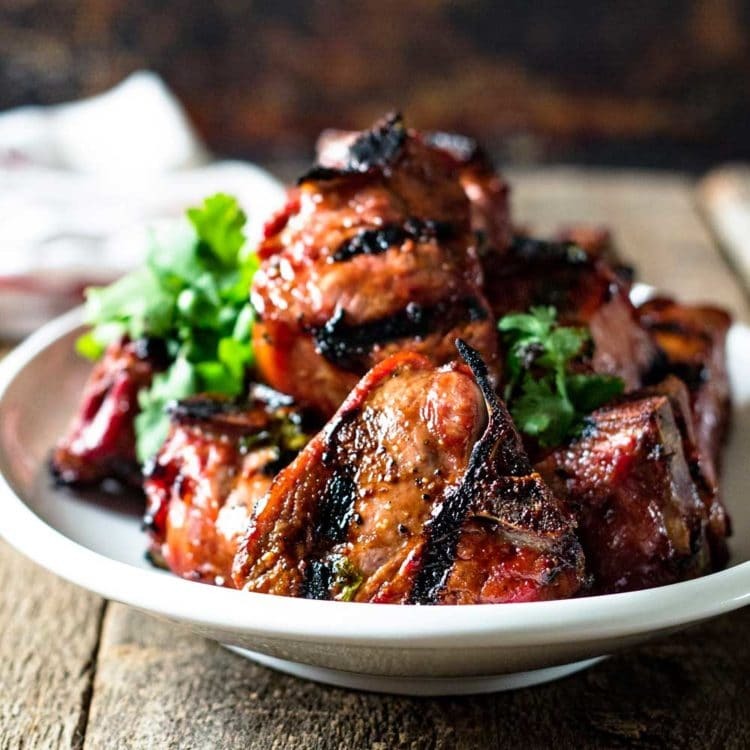 I love to cut it off the bone too, get a pan searing hot, then blacken to tender perfection using some butter and my Copycat Emeril’s Blackened Meat Seasoning for an incredible meal that’s on the table in no time. 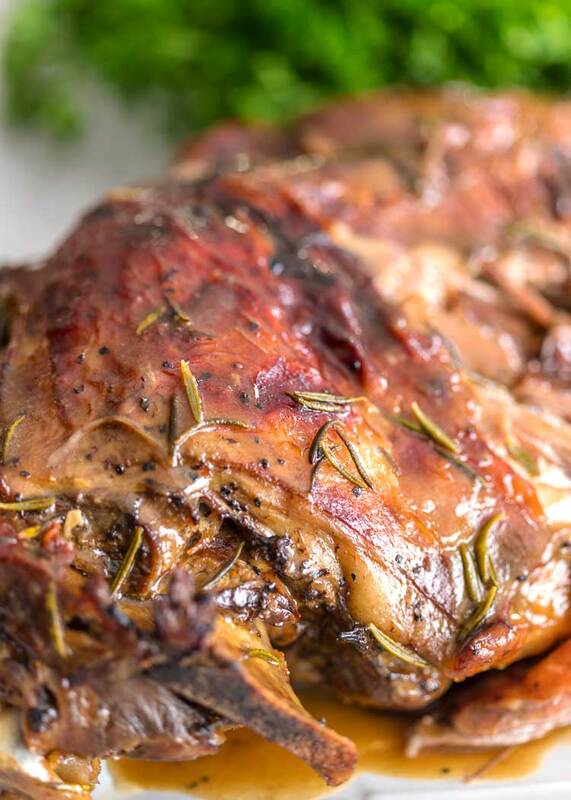 But a leg of lamb is perfect for that Sunday dinner or holiday feast. Can you tell I like lamb? 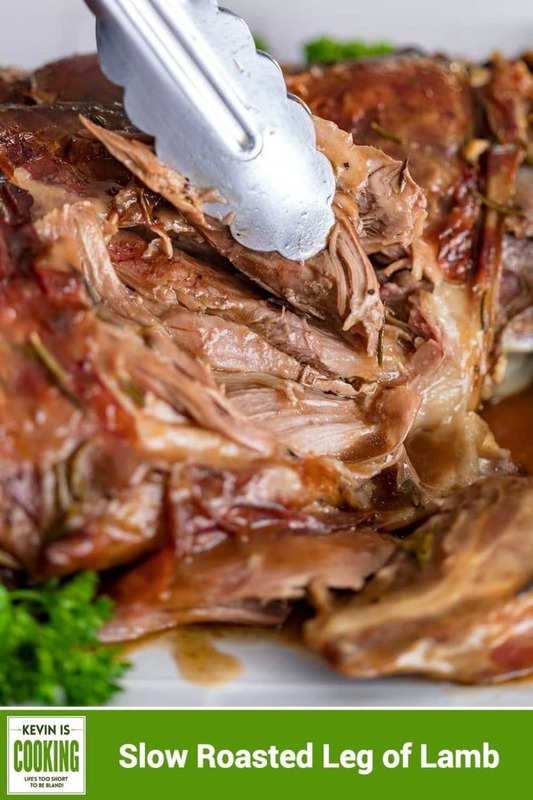 This slow roast leg of lamb recipe delivers tender, fall off the bone lamb. This isn’t a boneless leg of lamb recipe, nope. This uses bone-in, and that adds so much flavor! My roast leg of lamb gets seasoned all over with kosher salt and black pepper. That’s it! It then is laid on top of cut onions, carrots and celery, an entire head of garlic cloves that mellow as they roast, an orange that’s quartered and fresh sprigs of rosemary. The oven gets set at 300°F and this 5 1/2 pound leg of lamb roasts covered for 5 hours and uncovered for almost an hour. Crispy outside and tender inside. This is one of those dinners that all you needs are some tongs and the meat falls away from the bone. Beyond tender, succulent and packed with flavor, no carving knife is necessary. And the gravy… After removing the lamb from the roasting pan I place it right on the stove top and make the gravy after discarding the orange pieces and setting vegetables aside (keep warm). Keep the garlic though (read recipe), they add so much to the rosemary infused gravy. Perfect to spoon over when served with mashed potatoes. Enjoy! My roasted leg of lamb is seasoned, laid over vegetables, garlic, citrus and rosemary. It caramelizes to a golden brown, and pan juices make an easy gravy. Cut and quarter the onion and orange. Break up the head of garlic and remove skins or have 15-20 cloves peeled and ready. Rough chop the celery and set all in the bottom of a large roasting pan. 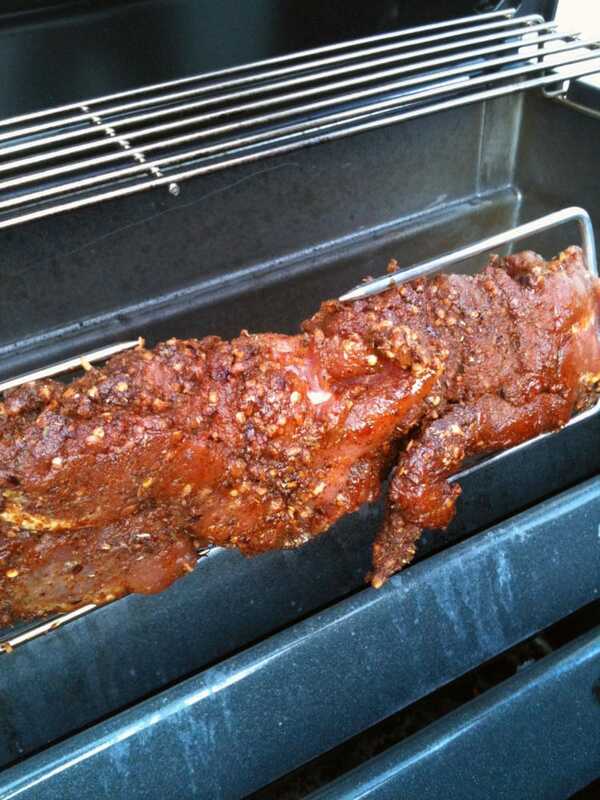 Lay the leg of lamb on top and season generously with kosher salt and black pepper on both sides. Leave the bone side up and pour in the beef broth and water. Drizzle the olive oil on top of lamb and then cover with aluminum foil and place in the hot oven for 5 hours (See Note 2 for different weights and roasting times). Remove from oven and set aluminum foil aside. 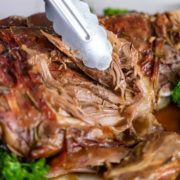 Carefully flip leg of lamb, baste with pan juices and return to oven to roast, uncovered for 45 minutes or until the outside is a rich, golden brown. 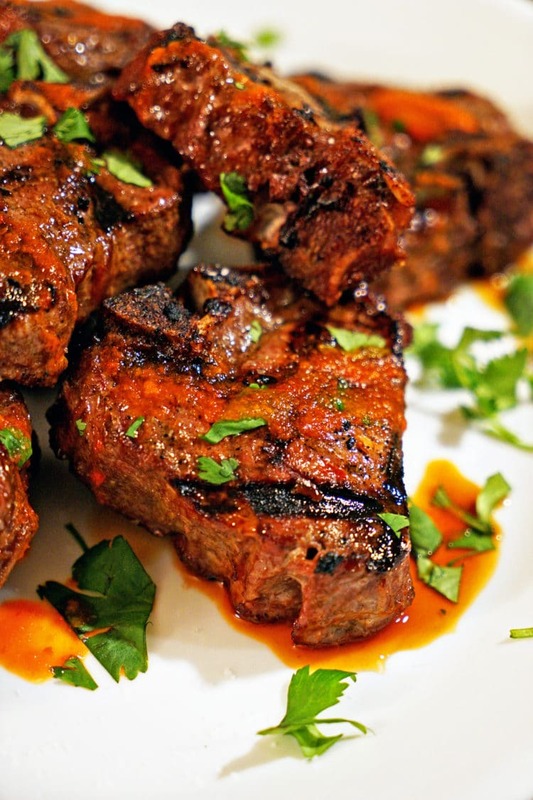 Remove lamb from pan and keep warm on a serving plate with the aluminum foil covering. Move roasting pan to stove top over 2 burners. Using a slotted spoon remove the vegetables (See Note 3), rosemary sprigs and citrus, leaving the roasted garlic. Mash the garlic with the back of a wooden spoon and bring the pan juices to a boil. 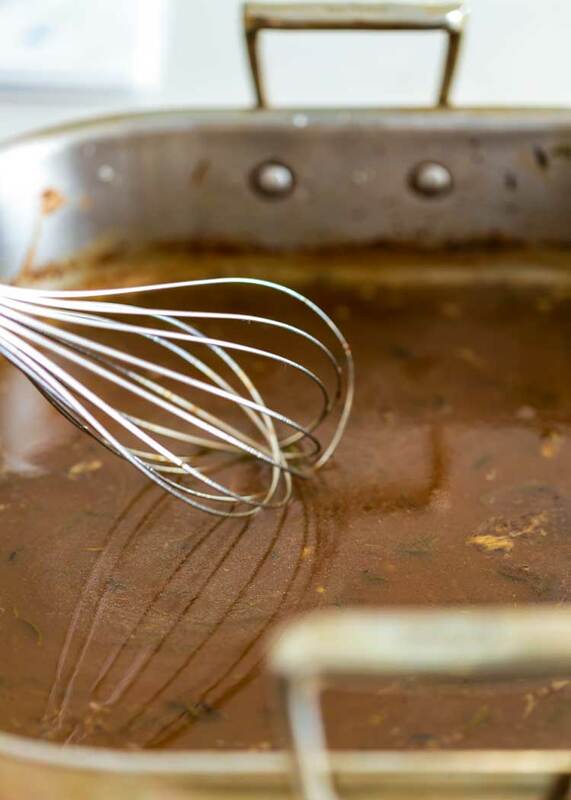 Sprinkle the flour over the gravy and whisk to incorporate. Turn heat to low and simmer until thickened. Add water if too thick, or cook longer to reduce if gravy is thin. Feel free to strain if you do not want the garlic/rosemary pieces and serve alongside roasted leg of lamb. I serve with mashed potatoes. For this recipe I use a 5.5 pound leg of lamb that feeds about 6 to 8 people. Oven temperature should be 300°F. For a 4 to 4.5 pound leg of lamb roast covered for 4.5 hours and uncovered for another 45 minutes or until the outside is a rich, golden brown. For a larger leg of lamb at 6 to 6.5 pounds, roast covered for 5.5 hours and uncovered for another 45 minutes or until the outside is a rich, golden brown. Feel free to eat the roasted vegetables when serving, but I find they can be a little over cooked myself and serve the lamb with mashed potatoes. Terrific recipe! So many lamb recipes are “herbs with lamb” but with this one you can taste the lamb and is it ever succulent. I used a small (4+lbs) boneless leg and the cooking times were spot on. The gravy was so good we could have eaten it with a spoon all by itself. Mashed potatoes were a perfect side. Thanks for directing us to a great Easter dinner. Thanks for trusting me with your big Easter shindig dinner Kathleen! Kevin, Thank you for such amazing recipes. I tried searching something in your search box and it does not seem to work. Thanks Matthew. What were you looking for specifically? In general, I would like to put in a word and looking something up. Like today, I am making your enchilada’s and was wanting to make a rice side dish. When I typed in “rice” the magnifying glass would not let me look it up. Thank you for your response. And on both desktop and mobile. Not sure what’s happening on your end, but sorry for any difficulty. When you say “it would not let you look it up”, do you mean you received no response, or a 404 page result? My mouth is literally watering looking at these gorgeous photos, Kevin. Talk about melt in your mouth!! 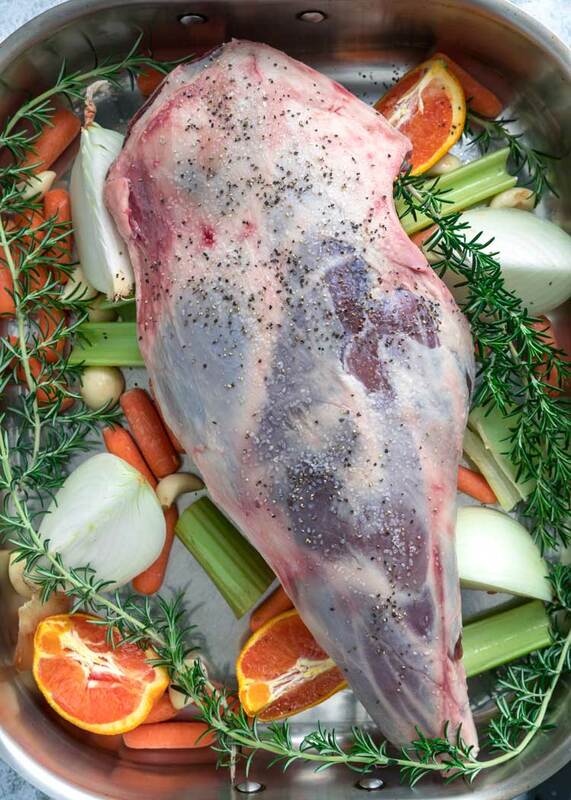 Looks like it’s leg of lamb in our house this Easter! Saw this over on IG and had to pop over to check out the recipe ASAP Kev! This looks absolutely mouthwatering! Send napkins – I’m drooling! This lamb is perfection! SO tender and juicy! Haha! Thanks Chey. It is supremely delish! We raise lamb and the last legs of lamb were boned by the butcher. What changes would I make for a no bone leg of lamb? I’ve added this info to the Notes on the recipe card, too. Hi Kevin, this recipe sounds delicious! Can this method be used to cook a leg of lamb medium rare instead of well done? Thanks! 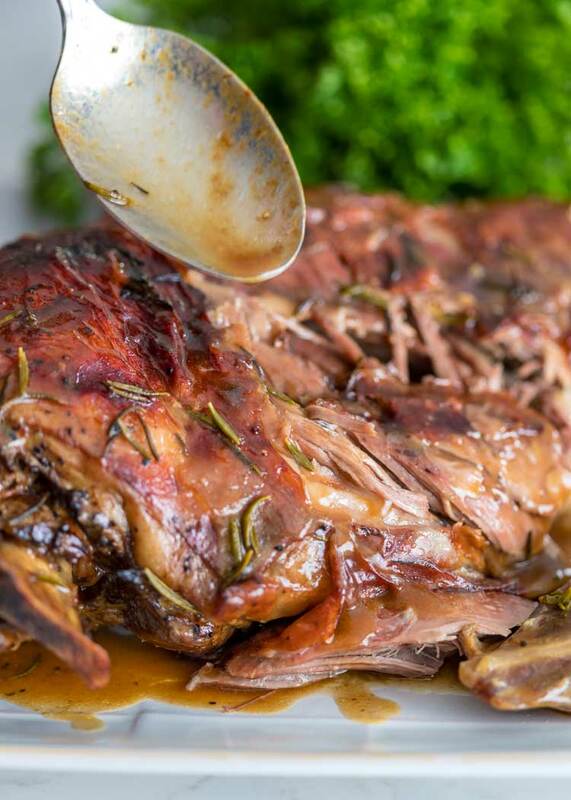 why would you want to discard the veggies from the roasted leg of lamb? I can see removing them ,but not discarding them because the veggies have so much flavor. Hey there Marshall. I made notes on that. I find they get too overcooked myself, but feel free to use them when serving with the lamb. The main point was to say discard the citrus pieces. I’ve updated to reflect. Thanks for stopping by.